Sale on Chrome Knuckles - Only $8.95 each - Put one in the cart and see. are For novelty or collectible purposes only. 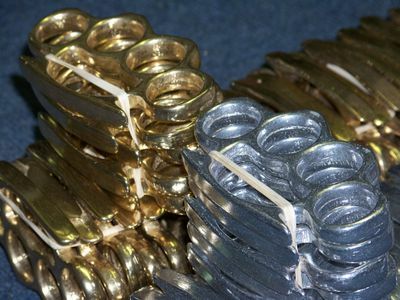 Real brass knuckles were used in some of the most famous close-quarters battles ever fought, including some skirmishes during the Civil War and in World War I. Now, they are largely used for novelty purposes and added to collections. They make wonderful paperweights and stage props, as well. As you browse for a set for your own collection, please note that these real brass knuckles are made from an alloy of copper and zinc. They are heavy, unlike the aluminum kind. At DefenseDevices.com, you will find these paperweights for stage props or as gag gifts in a variety of sizes, including those with finger holes that measure as much as 1 inch in diameter. We also carry models in polished pure brass that make excellent belt buckles, as they are outfitted with a belt stud. The solid Original brass knuckles without any adornment weigh over 6 oz, are polished and have finger holes bigger than a 14.5 ring size. These are made in the USA with a sand mold. The Natural Aluminum use an identical mold to the original(above) but are very lightweight, strong, solid aluminum and made in the USA. The BKC001 knuckles are imported, a bit lighter at 5.5 oz, with bigger finger holes and a higher polish. They are routinely sold at much higher prices but we have a great deal for you at this current sale price. You cannot use gift cards to purchase this item at DefenseDevices.com. Your shipping address must match your billing address, and we cannot ship to locations outside the U.S. Note: We can only ship this product to the billing address of the paying credit card, ie, dual address orders are not allowed. They are heavy and well built. great item. Dear Defense Devices, I am writing to let you know how pleased I am with your service and the speed at which you ship your online orders to your customers. After more than one disappointing order for an item my sons really wanted I was wary of trying yet again to order them. Many of the sites are simply scam sites and never ship the goods long after they have collected the payment. Repeated requests to their "online help" and phone calls to their listed number went unanswered. When I saw that Defense Devices was a Yahoo Trusted site, I felt a bit better about ordering so I took the chance. Five days later I had the product in my hands and the quality was everything I had hoped for and more, no hassles no endless e-mails and filing complaints with Visa in an attempt to get my money returned. My sons are very happy and so am I. Thank you so much. I will order from your company again.